The Western Regional Worldview Conference will be held at Canyon Ridge Church, Las Vegas, NV. Join Gary DeMar* of American Vision and Robert Andrews**, author of The Family: God’s Weapon for Victory, February 3 and 4, 2012! There is a war for the hearts and minds of our children, which has taken place since the beginning of time. God knows our enemy and has provided a way to win the battle. The Bible has something to say about EVERY part of our life – because God is the God of Creation, Biology, Zoology, Math, History, Healthcare, Education, the Environment and every living thing on earth. Is God defining reality in your home, or is someone or something else? Come to the first annual Biblical Worldview Conference to be equipped and challenged by the Word of God and to live accordingly. 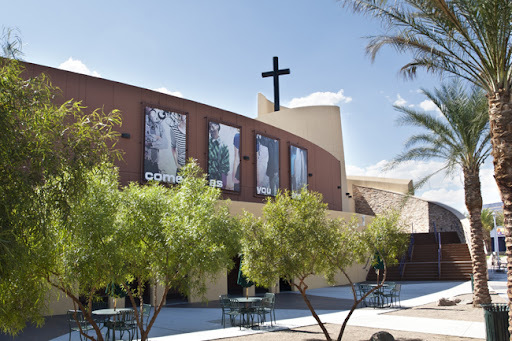 A 30 minute drive from McCarran International Airport, the church is conveniently located near lodging and restaurants and provides an onsite cafe. Sessions will begin Friday afternoon around 1pm and break Saturday afternoon and will include special presentations by Scott Gillis of Creation Ministries International*** and Samaritan Ministries International (more TBA!). Seating is limited, so mark your calendars now and register today! 25 rooms are blocked at the nearby La Quinta Inn Summerlin at a special rate of $85.50 per night until January 12, 2012 (if not booked, these rooms will release to the public and regular rates will apply). Please call 1-866-527-1498, mentioning group American Vision. 5 rooms are blocked at the University of Las Vegas at a rate of $46 per night until January 12, 2012. Follow the instructions located below to book. Las Vegas is ranked the #1 most inexpensive to transport to for events, and boasts an array of convenient airline arrangements via Delta, Southwest, American, Northwest, United and Frontier. A host of fine dining and lifestyle magazines – including Bon Appetit, Wine Spectator, Gourmet, Robb Report and Esquire – have honored the city of Las Vegas for its fantastic fare and hailed individual restaurants for their exquisite cuisine, created by the likes of Bradley Ogden, Hubert Keller, Alain Ducasse, Emeril Lagasse, and Wolfgang Puck. To accompany its growing list of world-class chefs, Las Vegas has attracted more master sommeliers than any other U.S. city. The fifty-plus golf courses in Las Vegas, designed by the likes of Jack Nicklaus, Pete Dye, Tom Weiskopf and Robert Trent Jones Jr., have put Vegas on the map for golf connoisseurs. Each course is within a one-hour radius of the city, offering challenging play and beautiful desertscapes, flowing waterfalls, rolling greens and mountain views. Only 25 miles from Las Vegas at its closest point with more than 550 miles of shoreline, Lake Mead Recreational Area offers outdoor enthusiasts year-round opportunities for swimming, water-skiing, camping, boating, fishing, tours and cruises. Scenic Red Rock Canyon is located just a few miles west and offers hiking, rock climbing or scenic drives. Not far away, you’ll enjoy the majestic Grand Canyon and legendary Hoover Dam. With an average low of 43 and high of 63 in February, we anticipate an enjoyable time of fellowship and sessions! * What is a Biblical Worldview? For the Christian, the difficult task of parenting is not subject to the latest psychological fads presented on Oprah or the current New York Times best-seller on the subject. It is firmly anchored on what the Bible says, and the Bible is not silent on the topic. In this session, Robert presents three basic biblical principles that parents must understand before they are equipped to parent successfully: 1. Understanding oneself 2. Understanding one’s child 3. Understanding how one relates to his/her child. Grasping these truths experientially is vital if the parent hopes to win his/her child’s heart. Teaching is downright impossible without a willing learner, no matter how good the curriculum or the teacher. The Bible teaches that proper discipline is an expression of love, and the one who neglects it really hates his child! Robert explains the distinction between discipline and punishment and proposes a model for discipline that invariably breaks rebellion and results in bonding between parent and child. The “ought to’s, need to’s and should’s” that motivate many children will be changed to “want to’s” as they experience a desire to please parents who love them enough to discipline them diligently. Parents often confuse their job with God’s job in the life of their child. God has designed that He alone brings spiritual life. But He has given the parent the job of building character. What biblical character traits can we as parents self-consciously set as a goal for our children and how can we train them in such a way that that goal will be achieved when they leave our home as adults? A powerful and attention-grabbing presentation on the vital importance of the Bible’s history in Genesis: how it is foundational to the Gospel and relevant to our world and society. The authority of the Bible is paramount. Items of scientific evidence are woven into the presentation in a way that is easily understood by the layperson, as is the Gospel message. Christians are motivated to become armed and equipped to be able to ‘give an answer’ and to be vastly more effective at personal evangelism, thus stimulating church growth. In addition, their own personal faith is strengthened. Non-Christians are challenged to see the issues in a different light, and at the same time get salvation-relevant information which an ‘evidence-only’ talk would not provide. Sponsorships are available for low prices! Email [email protected] to receive information on how we can help; feature your local or national business, organization or ministry at our highly-attended events!